It was the perfect ending to Wade’s fiery showdowns with San Antonio, albeit an unusual one with the fans serenading him with cheers as he walked off the AT&T Center court after one final win over the Spurs. Goran Dragic had 22 points and the Miami Heat snapped the Spurs’ nine-game winning streak with a 110-105 victory Wednesday night, sending Wade home a winner in what was likely his final game in San Antonio. San Antonio saw its 11-game home winning streak come to an end but remained fifth in the West. It was the Spurs’ first loss since Feb. 25 in Brooklyn as part of their 1-7 Rodeo Road Trip. The Spurs rallied from a 12-point deficit entering the fourth quarter to pull to 108-105 on Rudy Gay’s floater with 1:07 remaining, but a turnover by DeMar DeRozan and a pair of free throws by Kelly Olynk sealed the victory. Wade finished with 11 points, including a running 3-pointer from halfcourt that brought the crowd to its feet in celebration of one of the Spurs’ fiercest competitors. Wade couldn’t wait to open the gift the Spurs gave him, which included signed jerseys from Duncan, Parker and Ginobili. 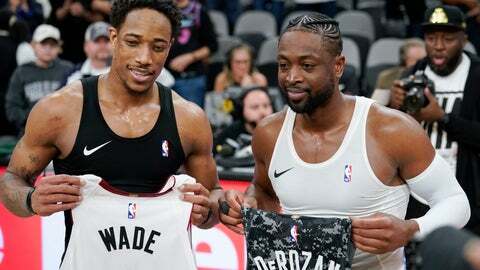 Wade also exchanged jerseys with DeRozan at halfcourt following the game. The crowd serenaded him with “D-Wade” chants as he did a postgame interview and as he walked into the locker room. Heat: Miami’s previous win at San Antonio was March 31, 2013, when Chris Bosh scored 23 points, including the game-winning 3-pointer, to stun the Spurs 88-86 as Wade and LeBron James sat out for rest. … Miami is 17-16 on the road after finishing 18-23 last season. … Justise Winslow missed the game with a bruised right thigh. Spurs: Mills played in his 521st game with the Spurs to move past Danny Green into the top 10 in franchise history for games played. Bruce Bowen is ninth with 630 games played for San Antonio. … Marco Belinelli became the 11th player in NBA history with 400 3-pointers off the bench.